What haven't I been blogging? Too many other interesting things to do! Am taking some classes this year, hoping to keep my aging body well-tuned and limber. So it's off to Feldenkrais and Reflexology on different days of the week. Had been thinking about starting yoga again, but it can be so depressing when you find you can no longer manage getting into positions that were once so simple. When you start something new it's OK not to be good at it (that's my theory). These two classes are on top of my usual Croquet game, which has been my long-time weekly sporting fixture. Watering, weeding and checking the garden for pests and diseases takes up a bit of time each day. 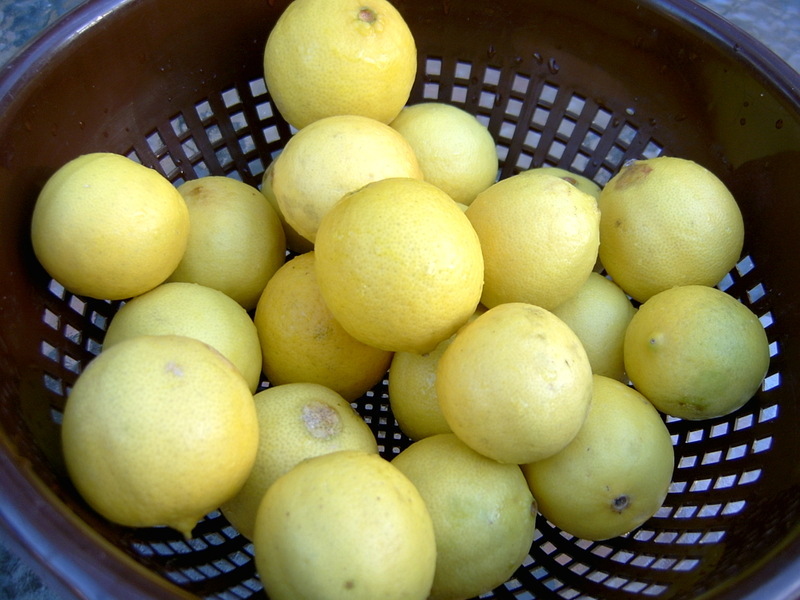 As does picking the fruit - oranges, lemons, limes, lemonades, kumquats and pawpaws at present - and the odd pepino, cape gooseberry, passion-fruit and dragon-fruit some days. But the picking is the easy part. It's using or getting rid of our produce that takes the time. And the cost of the fuel to take them to someone as a gift is worth more that the fruit itself. The limes are all falling and have to be raked up from under the tree. I took some bags to Vinnies and I made a batch of marmalade but that didn't use up many. I like the limes cut very finely, so it's a fiddly job. I made only 5 jars this time, as there is still some left from last year ... and the year before! I am the only person who eats it. Kids don't like it, of course, but have you noticed that men rarely eat marmalade? The man at Vinnies made the comment when I dropped in the fruit. He said he liked making it but never eats it. Too bitter. Nor does my husband like it. In fact the day after I made the marmalade, he did some preserving of his own - Sweet Chilli Sauce. Sauce is a good way of using up all our excess chillies. The chillies did well again this year - all different kinds - so he mixed the red, green and yellow ones together and made a good big batch. 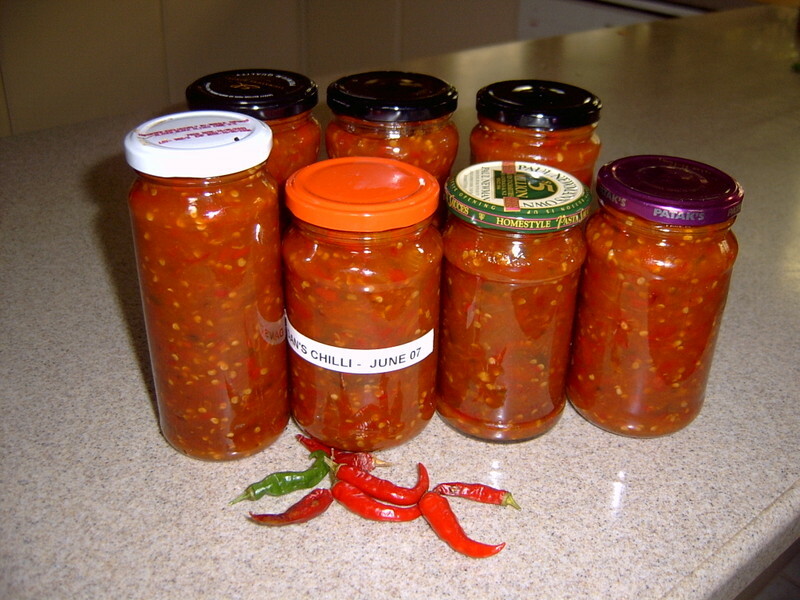 We have no trouble pressing jars of chilli onto family and friends. My marmalde isn't nearly so popular. 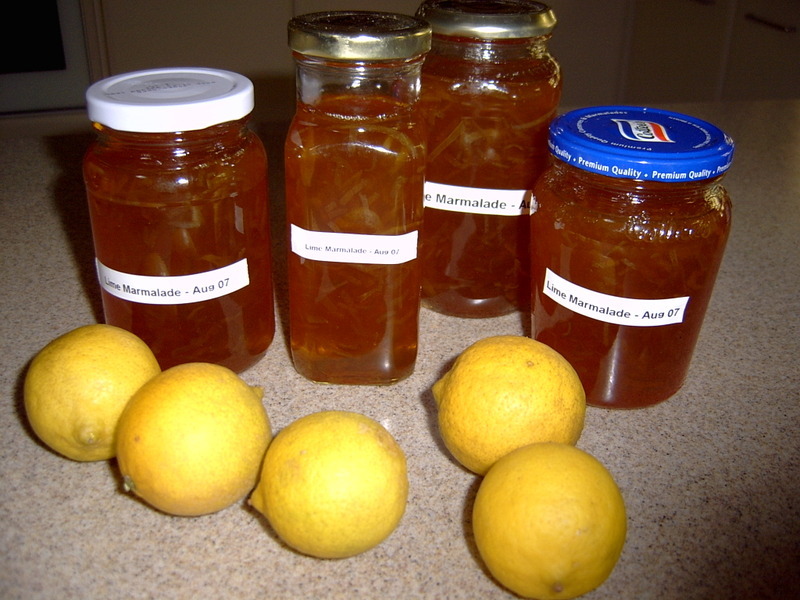 Oh my, I LOVE lime marmalade, as I'm sure I would love almost anything made from your garden produce. Couldn't you teleport it? Yes, I too would not say no to lime marmalade, however, I might put those limes to use in gimlets...Sheesh, limes falling, just like that?? You are SO lucky! never had lime marmalade. orange is the standard in stores here, lemon is the standard, very rare, exotic. but limes are easy enough to buy, i'm drinking a few right now. yes also to feldenkrais and reflexolgy. and ida rolf. i expect you'll be doing yoga on the croquet court in a few weeks. I also am not a big marmalade fan...but everything else you mentioned sounds delish. I stopped by on the off chance that you may be back blogging and was rewarded! Any chance of the chilli sauce recipe? Can't get over the exotic riches of your garden, unimaginable here. But we do have a glut of apples this year and pounds and pounds of plums. Can't give 'em away locally, we just have to stock up the townie visitors with bagfuls when they come. It's been so long Jude. I just dropped in tonight to see if you had reappeared, but didn't hold out much hope. So imagine my surprise. Good luck with your new interests. it's been a long time again. i'm just sayin' ya know? Just dropping by to wish to you and yours a MERRY CHRISTMAS! Yes, Elsewhere, I've noticed that too! Hope Jude is reading this and knows that people are still thinking about her. On the spur of the moment decided to drop in to see what you were up too. Glad to hear you are busy and adding new interests to your calender. Jude should do some "Community Work". It's good therapy. goodness, almost two years without posting!